Canadian Space Agency astronaut Chris Hadfield, commander of the International Space Station, reveals Canada's new space-themed $5 bank note, April 30, 2013. The Bank of Canada had appropriate help Tuesday (April 30) launching its new space-themed $5 bill – the Canadian commander of the International Space Station. "Let me show you an example of how we can reach new heights of innovation," Canadian Space Agency astronaut and Expedition 35 commander Chris Hadfield said, while revealing the astronaut- and robot-arm-adorned bank note from on board the orbiting complex. According to the Bank of Canada, the new $5 bill features "leading-edge security features" as already present in the $20, $50 and $100 polymer notes now in circulation. The bank also released its new $10 note today, which depicts a Canadian train. "The polymer series notes are at the frontier of bank note technology. The new $5 and $10 bank notes depict the frontiers of our country and our planet," Bank of Canada Governor Mark Carney said. "It is fitting that we are today crossing the final frontier for a world first — the unveiling of a bank note from space." The new bills include transparent and holographic design elements, making them part of the most secure bank note series ever issued by the Bank of Canada. The polymer series is also described as more economical, lasting at least two and half times longer than cotton-based paper notes, and they will be recycled in Canada. The Bank of Canada's new $5 bank note features a space-theme with the Canadarm2 robotic arm, Dextre manipulator and a spacewalking astronaut. The new $5 bill, as revealed by Hadfield, features images of the Canadian-built Canadarm2 and Dextre, robotic arms and manipulators that were used to build and now maintain the space station. They symbolize Canada's ongoing contribution to the international space program. Hadfield, who in 2001 became the first Canadian to walk in space while helping to install the Canadarm2 outside the space station, said he tries to inspire young Canadians to aim high. "This new $5 bill should do the same," he said. "By giving prominence to Canadian achievements in space, this bank note reminds us that not even the sky is the limit." The note's design also includes a spacewalking astronaut, though the Bank of Canada did not specify if it was meant to be Hadfield. The astronaut can be identified though, as a Canadian by the country's red and white, maple-leaf flag appearing on the arm of the spacesuited figure. The front of the new $5 bank note features a portrait of Sir Wilfrid Laurier, the Prime Minister of Canada from 1896 to 1911. The previous $5 bill, still in circulation, also features Laurier on one side. The reverse depicts children engaged in winter sports, including sledding and hockey. The Bank of Canada's new space-themed $5 note is a safer kind of dollar. From left to right: David Saint-Jacques, Canadian Astronaut; the Honourable Jim Flaherty, Minister of Finance; Mark Carney, Governor of the Bank of Canada; Paul G. Smith, Chairman of the Board of Directors of VIA Rail Canada. The $5 bill is the lowest denomination bank note circulated in Canada. The new space-themed bill will be available to the public starting in November. This is not the first time that Hadfield has been included in the release of Canadian money. The Royal Canadian Mint released coins in 2006 that featured the Canadarm2 and a portrait of the record-setting astronaut. The silver and gold coins carried a face value of $30 and $300, respectively. In addition to the Canadarm2 and the two-armed Dextre (the latter also known as the Special Purpose Dexterous Manipulator), Canada's space achievements also include the Canadarm, the robotic arm flown on board the now-retired space shuttle. The first Canadarm flown in space was returned by NASA to Canada last year to go on public display at the Canada Aviation and Space Museum in Ottawa. 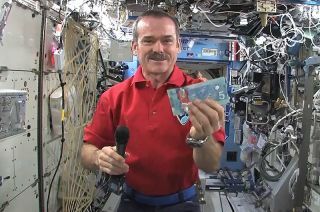 Click through to collectSPACE.com to watch video of astronaut Chris Hadfield revealing the new Canadian $5 bank note from on board the International Space Station.